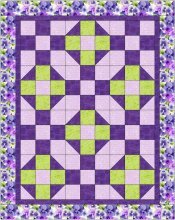 In this class, you will learn about selecting quilting fabrics and materials; How to use quilting tools; Rotary cutting techniques, Finding and maintaining a consistent 1/4" seam; Piecing (block construction); an introduction to "Quilt Math"; Figuring and applying borders; Layering and basting; Machine Quilting; and Binding. 7 weekly sessions, 2 hours each. Class begins Tuesday, January 15 at 11am-1pm, and concludes February 26. 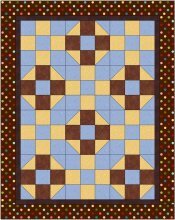 While you are learning, you will construct a crib sized quilt or wall hanging, made of three or more fabrics, approximately 35 x 45 inches. After enrolling, we will email a supply list to you. Requirements: BEFORE taking this class, you must have a solid working knowledge of operating your sewing machine, adjusting tension, filling bobbins, changing needle position, etc.